New Santa Ana | Why not save money in Santa Ana by using the Sheriff’s Swat Team? Why not save money in Santa Ana by using the Sheriff’s Swat Team? The City of Santa Ana is once again grappling with a difficult budget and finding ways to make ends meet. 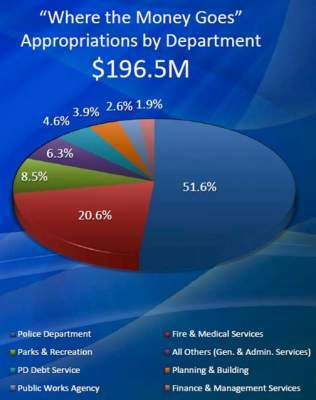 Fully 77% of the City’s budget is dedicated to police and fire. What about consolidating the Santa Ana Police Department’s separate swat team into a regional swat team – perhaps with the Orange County Sheriff’s Swat Team? There is absolutely no need for each City to have a separate swat team when most of the time they are in training. The SAPD’s Swat Team is called upon very rarely and sparingly. Surely the City would realize a huge savings by contracting out this service? 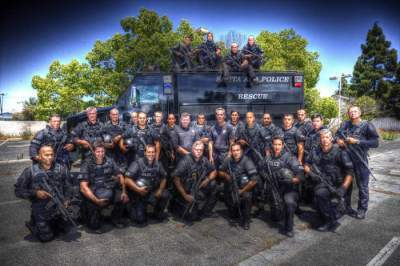 “The SAPD’s Special Weapons and Tactics team consists of 37 highly trained personnel capable of responding to and handling acts of terrorism, barricaded suspects, hostage situations, riots, dignitary security, and high risk warrant service, as well as the protection of lives and property,” according to the SAPD’s website. Are those really issues that our city is dealing with on a daily basis? Really? It looks like the Orange County Sheriff’s Office already contracts out SWAT services to 12 “contract” Orange County cities, County agencies and the local courts. Why not use the County Sheriff’s SWAT team and save some money here in Santa Ana? The Sheriff is based here in Santa Ana. Their department already polices our County buildings and the Courts. We should also be thinking about outsourcing the entire SAPD to the Sheriff – the City of Yorba Linda did that recently and they were able to save a lot of money compared to what they were paying the Brea Police Department previously. Great idea! The City needs to save money wherever possible and it makes no sense for separate municipalities to incur the costs of training a SWAT team that is rarely utilized. This is precisely the sort of service that should be contracted with the Sheriff’s Dept. and costs spread among different municipalities. Please be advised Mr. Editor that it is not in the best interest of any government of any political structure to save money. The objective of any government is to spend and tax as much as possible. For example, if you would be in charge of any governmental department with a budget of 10M and in the end of the year you would save 2M next year your department would get only 8M+ cost of living. So there is no incentive to save any money in any governmental institution, only in private sector saving it is reworded. You have to understand that effective government would grow which creates self destructive loop for the society. In contrast the growth in private sector is prosperity. Since people are in general moron mongoloids who can’t govern themselves, time to time, there must be crises to reset everything and start all over again with the same self destructive governing. The Federal, State, County and City’s governments must go BK or into a major crises before it gets any better. It took communists to self destruct from about 1918 to about 1988, about 70 years about 4 generations only to implement progressive liberalism in EU from about 1988 to 2008 to get busted again in about 20 years about 1 generation. It will take about 10 more years before we hit the bottom and start same BS all over again. Never in the human history there was a sustainable prosperity and there never will be one. So we must enjoy our existence where good times becomes good memories and bad times becomes good lessons. Is Santa Ana terrorism growing or lessening? Or has it been stagnant at about zero for two decades. Socially Conscious Protesters that write drunk emails do not count. I heard Michele, David and Roman were going to press hard to dedicate funds to PAYAN X. A personal training “TRIBE” that Michele has been attending and promoting to shed pounds. 2)Established a marriage counseling sevice via TWITTER???? QUIT/FAILED. 3) LOST Fifty pounds and became a “personal trainer” and “warrior maker”, but charges only for coffee? So now Monday, he is going to look for support from the council for???? free real estate for his “business”? Santa Ana has plenty of gyms that pay rent and TAXES. what is PAYAN X bringing? Maybe Marc can provide proof of insurance? Maybe he could rent space. Look for Martinez to tout the obesity rates and quote the VOC. Well, listening to Michele, maybe she ought to be talking about graduation rates and reading levels and not how “cool” it is to have underemployed twenty and thirty somethings throwing javlin’s and spare tires around downtown every morning. At least Pulido tried to bring a streetcar and as professional sports team!! This is Davids idea of Vibriant??? My answer to Payan X. Don’t eat too much. Don’t drink too much. When you save money, you lessen the stress. Stress is the biggest releaser of Cortizol. That is what puts weight on your belly. Live with a good conscience, stop wasting money, and reduce half of your weight gang issues all at the same time. Opt out of the propaganda machine. Except for NSA. OF COURSE! Payan X wants some free real estate? For Market-impressionable twenty somethings etc? Stick with the empty alley way. It is all the rage! Urban Chic Forever!